Submitted by Norm Roulet on Tue, 07/18/2006 - 03:59. His last words were: "After 39 years, this is all I've done". 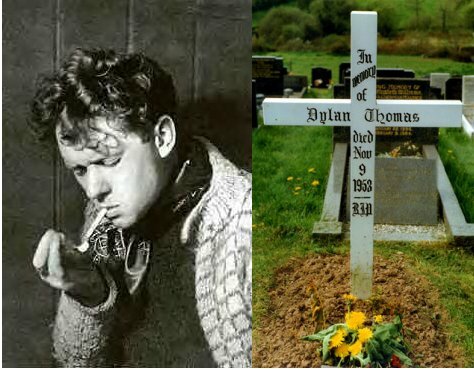 The two poems below are Audio Recordings of Dylan Thomas reading his own poems. They are provided by Leon Malinofsky. A browser 'plug-in' or standard Windows ".wav" player may be required. Official Dylan Thomas website, by his son. Thomas addresses wise men, good men, wild men, and grave, or serious, somber men all with the same message to pursue their passions even in the face of their and impending death. The message is not to let your passions be compromised. However, we are subtly reminded throughout that their rage will be ineffectual in the face of death. Dylan Thomas is widely considered one of the greatest twentieth-century poets writing in English. He remains the leading figure in Anglo-Welsh literature. His vivid and often fantastic imagery was a rejection of the trends in twentieth-century verse: while his contemporaries gradually altered their writing to serious topical verse (political and social concerns were often expressed), Thomas gave himself over to his passionately felt emotions, and his writing is often both intensely personal and fiercely lyrical. (Thomas did, nonetheless, write at least four war poems, one of which is especially famous: "A Refusal to Mourn the Death, by Fire, of a Girl in London.") Thomas, in many ways, was more in alignment with the Romantics than he was with the poets of his era. Thomas also differed from many major twentieth-century poets (dating from the Imagists onwards) in his championing of oral poetry. In this sense, Thomas was well-adapted to his time: his rise coincides with the improvement and profusion of recording technology and radio. The audio-literature company Caedmon (now a division of HarperCollins) was launched with Thomas's recording of his story "A Child's Christmas in Wales." Thomas' short stories are poetry exploded. Most notable is a semi-autobiographical selection published in 1940 entitled, 'Portrait of an Artist as a Young Dog', in which he explores his youth. Aside from stories and verse, Thomas did a great deal of radio and film work, especially during WWII. His filmscripts (mostly propaganda) were done for Strand Films. One of these, Green Mountain, Black Mountain, is notable for its integration of verse into documentary (similar in this to Auden and Grierson's Night Mail from the 1930s). Another, These Are the Men, is a singularly creative attack on Nazi leaders. He also experimented with creative filmscripts; his The Doctor and the Devils was filmed in 1985 with Timothy Dalton, Twiggy, and Stephen Rea. His radio broadcasts were generally literary talks; Under Milk Wood and A Child's Christmas in Wales both seem to have originated in radio talks. Thomas also worked on an unfinished novel, Adventures in the Skin Trade. The roughly 60 completed pages are a good beginning at a comic Bildungsroman. Thomas's circle, sometimes known as the "Kardomah Boys" after the coffee shop where they often met, included the composer and old school friend, Daniel Jones, the poet Vernon Watkins, the poet Charles Fisher and the artists Alfred Janes and Mervyn Levy. Brought to the attention of the public by the discerning eye of the English Romantic poet Victor Benjamin Neuberg,the poetry editor of the Sunday Referee, Thomas was invited to London by Neuberg and introduced to the capital's influential literary critics. He is particularly remembered for the remarkable voice-play Under Milk Wood, for his poem Do not go gentle into that good night which is generally interpreted as a plea to his dying father to hold onto life, and for the short stories A Child's Christmas in Wales and The Outing. Thomas liked to boast about his drinking. During an incident on November 3, 1953, Thomas returned to the Chelsea Hotel in New York and exclaimed "I've had 18 straight whiskies, I think this is a record". He collapsed on November 9, 1953 at the White Horse Tavern, in Greenwich Village, Manhattan after drinking heavily while in New York on a promotional tour; Thomas later died at St. Vincent's Hospital, aged 39. The primary cause of his death is recorded as pneumonia, with pressure on the brain and a fatty liver given as contributing factors. 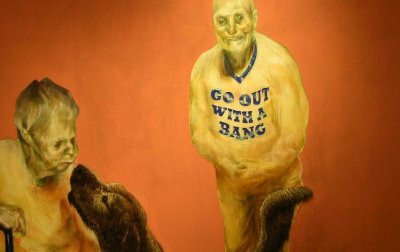 His last words, according to Jack Heliker, were: "After 39 years, this is all I've done". Following his death, his body was brought back to Wales for burial in the village churchyard at Laugharne, Wales, where he had enjoyed his happiest days. In 1994, his widow, Caitlin, was buried alongside him. "Prism - The Artists Supply Store Painting Award"
Submitted by Norm Roulet on Sun, 04/12/2009 - 14:23. The bright light of genius is so often extinguished before our time, yet the glow may live on to inspire those who follow. In these times of unreal NEO, these words of Dylan Thomas of youth, speaking to his father of old, may serve to inspire all generations here who pursue to appreciate and follow the beauty of unique genius so abundent in our community, and who burn and rave at close of day to make this a better world for all. Submitted by jerleen1 on Sun, 04/12/2009 - 18:06. Sorry Guys, but I like Lord Tennyson and Edgal Allen Poe. In visions of the dark night, I have dreamed of joy departed, but a waking dream of life and light, hath left me broken-hearted. Ah, what is not a dream by day, to him whose eyes are cast, on things around him with a ray, turned back upon the past? That holy dream - that holy dream, while all the world were chiding, hath cheered me as a lovely beam. a lonely spirit guiding. what though that light, thro' storm and night, so trembled from afar, what could there be more purely bright, in truth's day star? Tennyson's "Crossing the Bar" is another of my all time favorites. Sunset and evening star, and one clear call for me, and may there be no moaning of the bar, when I put out to sea. But such a tide as moving seems asleep, too full for sound and foam, when that which drew from out the boundless deep, turns again home. Twilight and evening bell, and after that the dark, and may there be no sadness of farewell, when I embark. for tho' from out our bourne of time and place, the flood may bear me far, I hope to see my pilot face to face, when I have crossed the bar. Only at Case, only in NEO?